Is this the last chance to get in on these historic low mortgage interest rates? The average rate for a 30-year fixed mortgage fell this week to 3.89%, an 18-month low, from 3.97% last week, according to Freddie Mac's survey of lenders. What does this mean for you? The last time rates dipped below 4%, they dropped to a low of 3.35 for a month or so, but were generally around 3.5 - 3.7 for a 18 months. The current dip into this rarefied air seems to be driven by the slowdown in economies around the world and the likelihood that these nations will be attempting to prop up their economies. 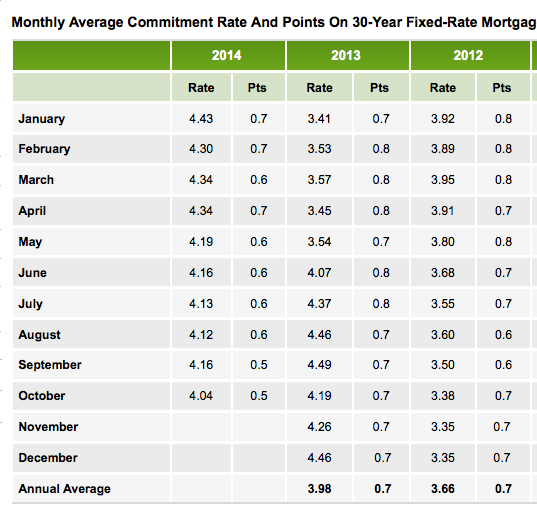 Will we get another 18 months for under 4% rates? Will we ever get down to 3.5% again? Our own Fed is expected to raise interest rates in the Spring. Will their effort actually result in increases in the marketplace or will international problems keep rates low? Stay tuned for answers to those questions. However, if you are thinking that you would ever like to buy or own, this is probably an outstanding time. You are seeing interest rates at less than 500 basis points from all time lows. You are seeing home prices slightly lower than the tops of last March. Home prices could continue to fall. Interest rates could continue to drop. But both seem naturally to be headed higher.